I can now declare a huge victory! 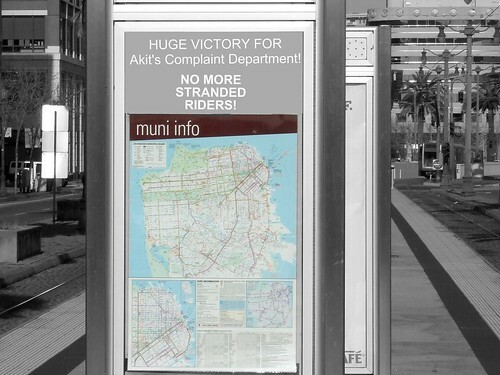 Akit's Complaint Department has been successful in having Muni adjust their bus schedules to fill in the two and a half hour gap of no inbound service at the 48th Avenue & Point Lobos terminal for the 38L-Geary Limited and 38-Geary. I've known for months that Muni has been leaving passengers stranded for nearly 2.5 hours on Saturday nights at the 48th Avenue starting point. The time gap is when the last inbound 38L-Geary Limited (5:37PM) departs and the first local 38-Geary departs (8:02PM). I finally got fed-up with the problem after seeing lots of people standing there with no bus in sight to take them home. On January 5th, I wrote a blog entry to expose this huge gap that left passengers out in the cold and my proof was reviewing the schedules posted on 511.org. The blog post got Muni's attention when they decided to take the easy route by posting an online notice to the public about no service on Saturday, January 15th. The next day, I criticized Muni for not trying to find a better solution, and for not placing signage at the bus stop to tell people of the 2.5 hour gap; nearly a dozen people were left stranded for hours for a Muni bus to take them home. The victory is super sweet today because Muni added extra 38L-Geary Limited buses to pick-up passengers on Saturday evenings from 5:37 to 8:02PM. 38L buses departs from 48th Avenue every 10 minutes starting from 5:30PM to 7:10PM, and the last three are 7:22, 7:35, and 7:48PM (see 38L Saturday inbound schedule). The next bus would be the regularly scheduled 38-Geary local bus at 8:02PM (see 38 Saturday inbound schedule). If you didn't read the above paragraph carefully, this is what makes my victory party even better, the 38L-Geary Limited service will now operate for TWO MORE HOURS! Why? That's because the old schedule said the last 38L is supposed to leave at 5:37PM and therefore the 2.5 hour gap until 8:02PM. Instead of adding extra 38-Geary local stop buses, they added 13 MORE LIMITED RUNS! (5:40PM to 7:48PM), which means, you can go out and eat dinner, and still catch that inbound 38L-Geary Limited bus home. A little blogger can make a big difference to our great city of San Francisco (Akit for Mayor or Supervisor?). Now, let's celebrate, sing it Kool & The Gang! Anyone want to dance the electric slide? UPDATE 1/25: I'm in today's SF Examiner! Click here to read article or get today's print edition and look at page five. Even though Muni screwed up, at least they paid attention and was able to respond and correct the error thanks to you. Great job and thank you for your vigilance. Now, we just need to get outbound 38L extended for another hour to match the inbound service and it'll be even better!